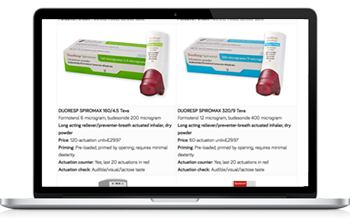 Images and key features of anticholinergic, β 2 agonist and corticosteroid inhalers, spacers and peak flow meters to help you identify, compare and recommend suitable devices during patient consultations. into the editorial content of this online resource. A print edition of the visual guide (last published January 2019), containing additional content, and initiated, funded and reviewed by Teva UK Limited, is also available. To receive a free copy, please email [email protected] including your name and practice address. Date of preparation: August 2018; UK/RESP/18/0010. is an educational initiative from Teva Respiratory designed to support healthcare professionals (HCPs), advise and empower patients and facilitate better communication between the two. The aim is to support and encourage the advancement of UK Respiratory care, and make a real difference to the lives of those living with asthma and COPD.